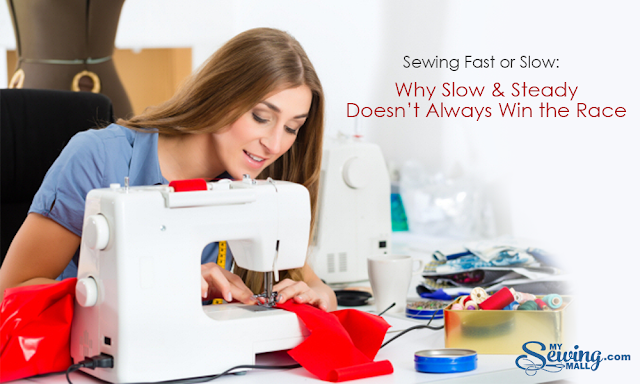 When it comes to sewing, what’s your speed? Despite what we might see on reality television, most of us are not able to crank out a ballgown in a mere eight hours. When you sit down at your sewing machine what is your strategy for creating a garment? Do you speed through your sewing projects or slow down and enjoy the process? We’re weighing in: What’s the best approach for sewing projects, fast or slow? For me, sewing is often an escape, a relaxation, a way to unplug from the activities of daily life and indulge in my creative side. The same techniques we use on the quick knit top certainly don’t apply to a tailored winter coat. In that instance the time invested pays off in a long lasting and strong wearing garment, validating our investment in both time and money. Sometimes the stars are in alignment and a garment goes along perfectly with not a stitch wrong or a seam to unpick. Other times it seems you have pinned, basted and sewn the same section so many times only to take it apart causing fraying of both the seam allowances and your nerves. But take heart because slow and steady pays off. Which camp do you fall into? Recently I asked my sewing friends this question and was very surprised by the answers. Here are some thoughts on the merits of fast or slow sewing and my possibly surprising point of view. Craftsy member Amy Alan has this observation, “Take your time! Tailoring is not something to rush through. Plan on giving yourself plenty of time to make this pattern, and don’t try to skip any steps. The key to a great tailored piece is patience.” The plaid matching and perfect shaping on her jacket show her time was well spent. On many patterns, the various instructions are numbered and some people find it helpful to check them off as they go. This is a great idea if you are moving into very complicated or advanced projects. Some people told they love that sense of accomplishment with each checkmark. A coat or jacket will probably take many hours to sew, but those hours are built up of all the small tasks that go into the final result. If I have just a few minutes, I like to have something quick to do, like catchstitch down the seam of a jacket collar. In a few minutes, I can accomplish a small step that gets me closer to a finished garment. Lots of fellow sewers told me they often squeeze in a bit of sewing in between work, family or other obligations. There are two categories of sewing that may seem on the opposite end of the apparel spectrum, but they have more similarities than you might think. Costumes and formal wear are two types of garments that I tend to sew very fast. A Halloween costume does not need to be finished with your finest tailoring techniques, it will be worn maybe a few times and then everyone will have grown out of it or be on to the next thing. So costumes, in my opinion, should definitely be sewn fast. Craftsy member Myka probably doesn’t agree with me about fast formalwear. You may not agree with me, but a long time ago I realized that formalwear is really a costume for an adult. The fabrics may be costly and luxurious, and of course you want it to look great and flatter the wearer. But, do the inside seam finishes need to be perfect? I don’t think so. Particularly if you know it is something you will wear once or twice at most! Who hasn’t had that invitation to some event and decided to make something, only to be racing to the finish line the night before? I have, and I will bet others have as well. Call me “shallow,” but in this instance I try to perfect the outside and leave my lovely inside finishings for a tailored coat or jacket. Now you know my sewing secret! So fast formalwear sewing, who agrees with me? The exception to the rule: However, there is one subsection of formalwear where I would never apply the rush treatment – the bridal gown. It is something to treasure and deserves the best effort. Craftsy member Kaytel made this beautiful bridal gown for her daughter after taking the Craftsy classes The Couture Dress and Sewing With Silks: The Liberty Shirt. We can see that every hour she spent was worth it in the end: It’s gorgeous! Okay fellow sewers: fast or slow, what’s your sewing strategy? Does it depend on the fabric and garment? Share your thoughts in the comment section!